When David McVicar's new Aida was unveiled at Covent Garden less than a year ago, it attracted little praise. I missed it on its first run, and it seems some of its excesses have been toned down second time round. On this occasion, too, it boasts a cast that comes closer to the sort of quality—at least in terms of sheer vocal glamour and heft—that Covent Garden should be assembling for such a show. Italian soprano Michaela Carosi was to have been the only one of the original principals to remain in the line-up, but even she had to withdraw at late notice (due to pregnancy, according to the official line). She was replaced by the Ukranian Liudmyla Monastyrska, moving her house debut forward a couple of months (she was already scheduled to appear opposite Simon Keenlyside's Macbeth later in the season). 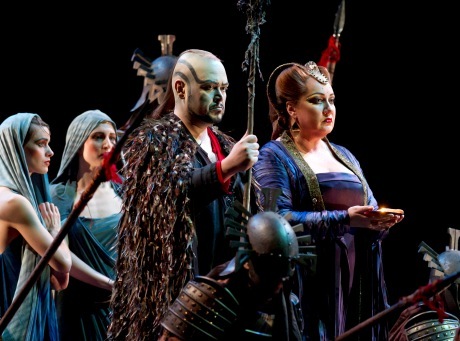 Beyond the tantalising prospect of Olga Borodina and Roberto Alagna battling it out as Amneris and Radames, the cast shows impressive strength in depth: Michael Volle as Amonasro, for example, and Vitalij Kowaljow—fresh from singing Wotan at La Scala—as Ramfis. Fabio Luisi, tipped by some to end up at the helm of New York's Met, provided another attraction in the pit. This sort of musical line-up, however, emphasised the considerable gulf between Verdi's opera as grand, ever-so-slightly camp vocal feast and the earnestness of McVicar's production—itself a feast of camp excess, but one indulged in with a slightly suffocating humourlessness. It was unclear whether the principals had been left to their own devices or had simply decided to do what they felt like (not beyond the realms of possibility, given the reputations of some involved). But there seemed to be two different shows going on here: the stand-and-deliver vocal duelling of principals who spent much of the time at the footlights, addressing the audience; and a production that, the programme suggests, tries to extrapolate the very personal sacrifices made in Aida into some grander anthropological point about human sacrifice. These two elements, rather than being complementary, seemed to vie for our attention, before ultimately undermining one another. And it was McVicar's vision that came out worse, its weaknesses cruelly underlined: the busy excesses of Moritz Junge's costumes; Jean-Marc Puissant's grim sets; the fact that the whole thing was lit (by Jennifer Tipton) with an unerring eye for uningratiating dullness. We were made too aware, meanwhile, that what few ideas there were had dried out by the final two acts. The tension was summed up in the final scene, where a lone dancer arrived at the back of the stage, arms providing a meandering accompaniment to 'O terra, addio'—all a bit unnecessary and pretentious. This was true, also, with the staging of the triumphal march, whose accompanying ballet was choreographed as a huffing-and-puffing martial arts display, the dreary machismo of which greatly overstayed its welcome. Anyone expecting a sense of grandeur in that scene will be initially disappointed, for grandeur only comes towards the end, and does so in purely musical terms as orchestra, principals and full chorus belt out the final ensemble. If McVicar's production is less than persuasive, then, the musical values are high. Monastyrska's Aida might not have Carosi's Italianate timbre, and there's little of the spinto in the voice, but the Ukranian is clearly a very handy singer whose traversal of the role was secure and musical. The voice itself is a good size, but seems to sit a little way back in the throat (and that's where many of her consonants remained). There's a Slavic darkness to the timbre, without it being particularly colourful, but the voice is remarkably well controlled across the range. Nerves kicked in as she approached her big moment in 'O patria mia', but she came through unscathed, and she is only going to relax as the run progresses. 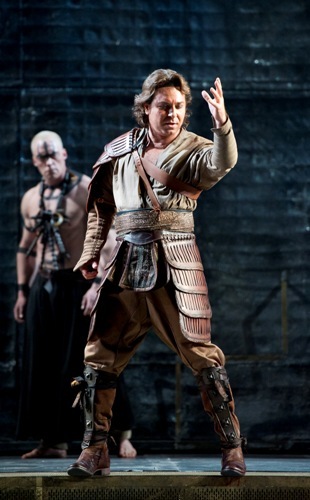 Despite Alagna's somewhat chequered history in the role of Radames, the tenor exuded confidence. The voice has acquired the necessary bulk over the years, and this was a hugely impressive vocal display, even if there was a lack of charm and grace at times (especially in the final duet). Vocal display, for Alagna, was evidently enough; and it seemed to be so for much of the audience, too. He sang mainly from the front of the stage straight to the audience (particularly noticeable at the moment Amonasro's identity was revealed in Act Three), and the acting extended little beyond stock gestures. Olga Borodina comes, perhaps, from a similarly traditional school of acting, but carries it off with much greater success. Imperiously unconcerned with the production as it fussed and faffed around her, she was in powerful voice and portrayed Amneris with an imposing dramatic honesty, rising to a compelling Judgement Scene. There are still few mezzos to match the great Russian in this repertoire, and this marvellous performance showed why it's worth persevering to catch her live. The finest dramatic performance, however, came from Michael Volle as Amonasro, and his act-three scene with Aida was a highlight, abetted by some wonderfully gauged conducting from Luisi. Kowaljow's Ramfis was imposing and extremely well sung, and Brindley Sherratt was excellent as the king, recast here as a kind of grand inquisitor, along with a bizarre entourage. There were many fine things from Luisi in the pit, and the conductor drew some excellent playing from the Orchestra of the Royal Opera House. Singers and orchestra occasionally parted company, however, and although the Italian unleashed some passion in the big moments, there was a hint of efficient routine and inflexibility elsewhere.